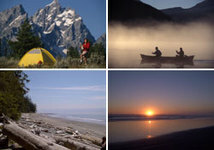 Situated just north of the American border and adjacent to the North Cascades National Park, Chilliwack Lake Provincial Park typifies a lush coastal environment. The large, valley bottom lake is surrounded by giant old-growth forests, with views to alpine ridges. The park is well suited for a weekend journey from greater Vancouver, and is well serviced by trails that lead through deep forests, along creeks to smaller lakes, and into the mountains. The lake itself is a boater’s paradise. The area was first opened up by the Hudson’s Bay Company improving First Nations trails in the mid 19th century, and later was expanded with logging operations. The facilities at Sapper’s Park, at the south end of Chilliwack Lake, were built by a visiting British company of military engineers during the Second World War. Visitors take to the sparkling waters in kayaks, canoes and small motorboats. Activities include good lakeside camping, hiking and backcountry camping, along with fishing and some mountain biking (use the Chilliwack Lake Forest Road to access The Depot and Paleface Creeks area). There are three main trails at this park: Lindeman Lake, Greendrop Lake and Flora Lake trails share the same trailhead at the Post Creek Parking Lot. Lindeman Lake is 3.4 km return; Greendrop Lake is 10.4 km return and Flora Lake is 14 km return. The Radium Lake trailhead (16 km return) is accessible from the Chilliwack Lake campground. The trails range from moderate to strenuous, and come with high aesthetic values as they pass through verdant forests, by smaller lakes and lovely viewpoints. Regular afternoon winds can make for good windsurfing, but also create difficult boating conditions. The clear water, at the edge of a sandy beach is enticing for swimmers, but the water temperature is very chilly, even in mid summer. Fish species include rainbow, cutthroat, kokanee, and dolly varden. Wildlife viewing in coastal forests can be difficult; however, with patient observation, one can see black bear, deer, cougar and other species in the park. The park offers four vehicle accessible campsites on a first-come, first-served basis. The camping areas are Radium Loop, Greendrop Loop, Lindeman Loop and Paleface Loop, which together total 146 campsites. There are no pull-through sites. There are pit toilets, picnic tables, fire pits, firewood and water – as well as a sani-station and a children’s playground provided. The campground is open from May 1 - October 9 and fees are collected during this time. There are backcountry campsites located between one and seven kilometers from the base area. There is one pit toilet located at the Lindeman camping area. Camping is not permitted on the shores of the lake. The park is located 64km southeast of town of Chilliwack in the eastern Fraser Valley. From Hwy 1 take Exit 104 and follow the signs for Cultus Lake to Cultus Lake Road. Instead of turning there, follow Vedder Road across the bridge and turn right onto Chilliwack Lake Road. Follow this road for 40 km to the lake.